them in olive oil. Remove chicken from skillet and add more oil, or butter, and some garlic and saute a minute. Pour in the cream. Add pesto and some sun-dried tomatoes, sea salt and pepper. Stir well. Bring to a simmer. Add the chicken back to skillet and simmer just until the sauce starts to thicken. This is not supposed to be a thick sauce, and it will thicken some when you add it to the pasta. 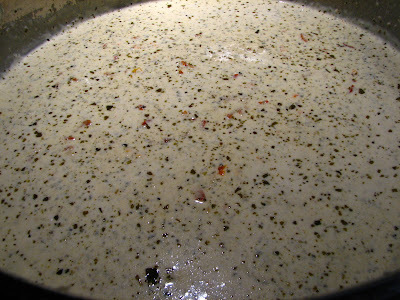 Taste sauce before you add the pasta and add more salt and pepper if needed. 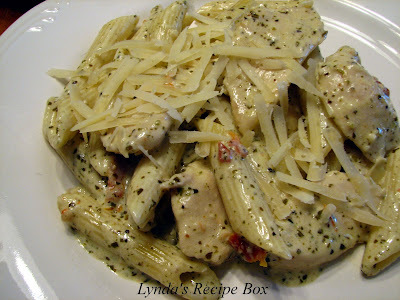 Mix pasta and pesto sauce together. Pile on plates and top with lots of grated Parmesan cheese. Chow down! It will make enough for 6 adult servings. 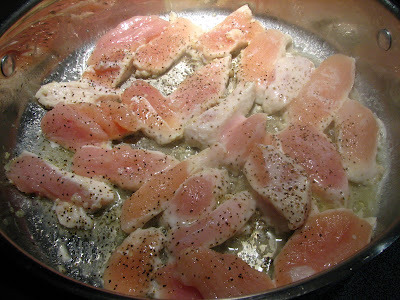 In a large skillet, add 2 T. of olive oil and saute sliced chicken breasts that have been salted and peppered, til barely done. Remove from pan to a plate. Add 2 more T. olive oil to skillet and the minced garlic. Stir until garlic is very fragrant, but do not brown. Add the cream, chicken broth or water, pesto, and sun dried tomatoes. 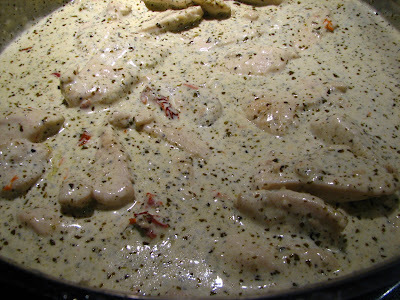 Bring to a low simmer and add chicken back to pan. Simmer only until sauce is slightly thickened, as it will thicken more after the pasta is added in. Taste and add more salt and pepper, if needed. I wanted the sauce to be slightly thickened, but thin enough to run into those delicious tubes of penne and coat them thoroughly! If your sauce gets too thick, add more chicken broth to thin it a little. 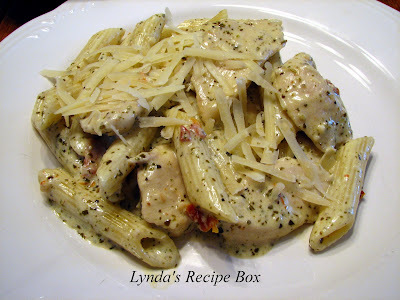 I did not add cheese to the sauce, but instead added lots as a topping on the pasta. I actually added more after the picture was taken! I made a fresh salad and garlic bread to accompany this meal. Enjoy! This is definitely the type of pasta I love. Looks delicious! Wow! My family would be storming the gates for this pasta. It looks and sounds delicious. Boy, oh boy--this looks like just MY type of dinner. I need to give this one a try soon. Yum! You have some great recipes! A friend of mine ordered something similar to that at a restaurant and i said I had to recreate it. Thanks for reminding me. That looks delicious! ooooh la la-di-da, that cream sauce sounds fantastic! i’m always impressed by folks who can recreate dishes they’ve had elsewhere—good for you! Now this is my kind of pasta - what a delicious sauce. That looks delicious! I cant wait to try it! Okay, this is right up my alley! This looks totally yummy! I wanted to let you know that you won the giveaway on my blog for the Pillsbury Simply prize pack! Head over there to see and to get my email to send me your info. Congrats!! I made this tonight. AWESOME. It was exactly what I hoped it would be. My kids had seconds - and then thirds! I made this tonight. AWESOME. Exactly what I hoped it would be. My kids agreed - they had seconds, and then thirds! The restaurant i had this at added walnuts to it....very delish!! !